A feng shui apartment reflects a balance between yin and yang energies. All apartment buildings have positive and negative feng shui features. While you can't change the apartment building or other structural features, you can add elements and other feng shui cures and remedies. 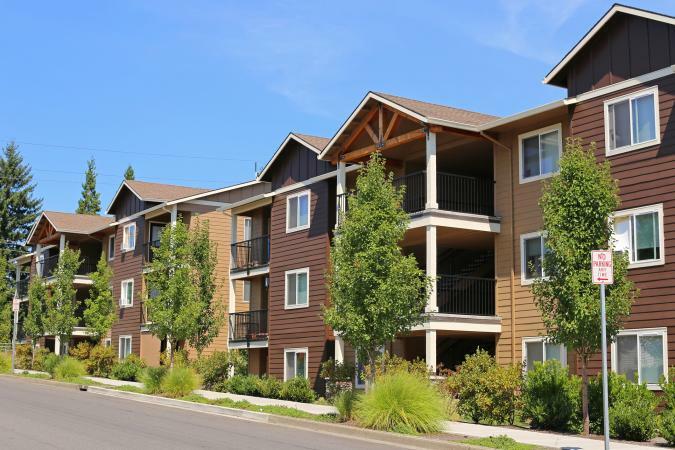 Just as you would do when selecting a home, you want to first pay attention to what surrounds the apartment complex. This includes natural and man-made features. Is the apartment beside or diagonally across from a hospital, funeral home, or other activity that is associated with negative energy? If so, you may want to consider living elsewhere. A water feature, such as a tiered fountain, meandering stream, or reflective pool with a fountain aerator, in the front of the apartment building or complex is most auspicious. A mountain in front of the apartment is inauspicious while one behind the complex is auspicious. Poison arrows, such as rooflines, taller buildings, utility poles, and intersections are inauspicious but have feng shui remedies. Avoid living in an apartment built into a hillside or along a ridgeline. These locations will result in harsh environmental obstacles and elements. In addition, this location cannot provide you with the support you need in general. There are several things to consider with a high-rise apartment building whether you are already living in one or apartment hunting. An attractive and uncluttered entrance is a must for good feng shui. An open and nicely appointed front entrance with a foyer is essential. This will allow the chi energy to enter and pool in the foyer before spreading throughout the building. Elevators should be in excellent working condition. Fresh décor, paint, and furnishings are a must, along with healthy lobby/foyer plants. Surrounding buildings are important. If your apartment complex is dwarfed by other buildings, you may need to use remedies in your apartment to counter the poison arrows these create. Good lighting in entrance and hallways is a feng shui must. Like a high rise, you want specific feng shui features at a larger, lower apartment complex to ensure you are taking advantage of auspicious chi energy. A complex should have neat landscaping, clearly marked parking places, and a parking surface absent of potholes and cracks. A curved road leading into the complex is more auspicious than a straight road. Building maintenance should be up-to-date, such as no peeling paint; make sure window and door locks work, there are no plumbing leaks or broken fixtures, and that all electrical outlets work. Trash bins are neat and not allowed to overflow. Classical feng shui practitioners use the ninth floor as the cut off point for using the apartment entrance as the facing direction. 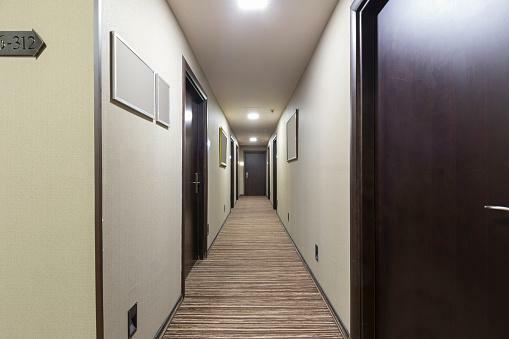 Taking compass readings for an apartment building can be easily divided into above ninth floor or ninth floor and below. If your apartment building doesn't have nine floors, you'll use the apartment building's facing direction. Apartments that are on the ninth floor and below use the front entrance door of the apartment building for the facing direction. Stand outside the main entrance of your apartment building. Take a compass reading to determine facing direction. The facing direction of the building is the one you'll use for the facing direction of your apartment. A park view out a smaller window would be a better choice than a large window that overlooks another tall building. A window that overlooks a busy street is a better choice than a window that overlooks an alleyway or a trash bin. Stand looking out the window and take a compass reading. This will be your facing direction. If you live in a multi-unit complex, instead of using your building for the reading, you'll use your individual apartment. Stand in outside in front of your main door and take a reading. The exception would be if the back of your apartment has more yang energy, such as traffic, a creek, or other type of yang energy activity. In this case, you'll use this direction for taking your facing direction compass reading. Once you have determined the facing direction for your apartment, you want to compare it to your kua number. You can calculate your kua number using an easy formula. This number will reveal is you are in the East Group or West Group. Each group has four auspicious direction and four inauspicious directions. Kua numbers are 1, 2, 3, 4, 6, 7, 8 and 9. The number 5 for male uses the same directions as number 2. Kua number 5 females use the number 8. In the charts below, the number 5 for both genders has been listed separately for easier use. For the best feng shui possible, you want the facing direction of your apartment to be in one of your four auspicious directions. You can introduce either the exhaustive or destructive element to the front door area of your apartment. Choose an object that genuinely appeals to your design sense, such as a statue, art object, or even a potted plant. Keep in mind that it is the element you wish to place in this area. If you use feng shui principles to decorate your apartment and apply feng shui rules of clutter and chi energy, the inauspicious direction shouldn't be a major issue. In addition, you can face your auspicious directions while eating, sleeping, relaxing, or working to reap the benefit of those energies. One of the biggest feng shui issues that face apartment dwellers are the many challenges outside their windows. If your views are unobstructed, then you may want to leave your curtains or blinds open as much as possible to let in the auspicious chi energy. If the view out your window isn't auspicious, such as overlooking a green area, like a park or a nice ocean or mountain view, then you may want to keep your blinds or curtains closed as much as possible to deflect poison arrows from towering buildings and alleyways. For example, if the street outside your window is stacked with mounds of garbage bags, simply keep your curtains drawn on garbage day and open them once the streets are free of the debris and clutter. If there is construction happening around you, deflect it by closing the blinds or curtains. You might decide to purchase a large painting to put over the window or a screen. Bamboo curtains can be used over the windows. Some are available with paintings of landscapes and other subjects for a different design choice and effect. There are some features in apartments that you want to avoid if possible. Most inauspicious features have one or more feng shui remedies. An apartment with the entry door is located at the end of a hallway. This is similar to having a home at the end of a road. The chi energy will slam into your apartment. Slow the energy with tall round/oval leaf plants outside and/or inside the door entrance. A multi-faceted crystal suspended just inside the door can help dissipate the chi energy when it enters. Your apartment has the entry door directly across from a staircase. A large floor plant or two at the entrance can help shield some of the forceful chi energy entering your apartment. If possible, hang a multi-faceted crystal in the hallway to slow down the chi energy. Your door is directly across from an elevator. 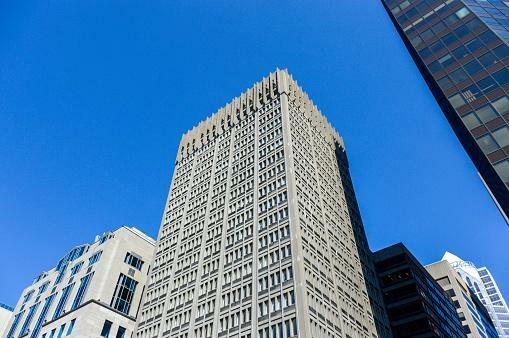 The open elevator shaft is known as a killing chi energy. It can result in great loss. There is no real remedy for this, short of moving. You may be able to minimize some of the effects by placing large round or oval leaf plants on either side of the door inside your apartment. A screen can be used to partially block off the entrance area to prevent the chi from rushing into your apartment. Your entry door is directly across from another apartment. In feng shui, this can create conflict with the other apartment dweller. Once more, you can dissipate some of the inauspicious chi energy this placement creates by using a multi-faceted crystal suspended from the ceiling just inside your door and/or plants on either side of the door. You can create a double door effect by using a folding screen to block the view of the door or even hang a curtain over the door to present a second barrier. Apartment is located at the top of a staircase. This placement brings a rush of chi energy into your apartment that will be unsettling. The use of plants and a multi-faceted crystal can slow down the chi entering your apartment. The toilet on the floor above you is directly above your entrance area. This is highly inauspicious. Leave a light on at your door entrance outside and inside a minimum of six hours a day. Plants can help absorb the negative energy generated by waste water. A bathroom door is visible from the entry door, such as to one side of the entry door. Place a full-length mirror on the outside of the bathroom door to make it disappear. Caution, if the bathroom is directly across from the front door, don't use a mirror since it will bounce all chi energy out of your apartment before it can enter. A window or door is directly across from the entry door. Chi energy will leave your apartment as quickly as it enters. Create a faux wall between these two with a folding screen or simply close the draperies or blinds on window or door. You can always arrange the furniture in your apartment to allow the chi energy to flow better. For example, you don't want furniture blocking the natural flow of traffic throughout your apartment. Select furniture to scale. Don't buy furniture that is too large and creates a cramped overcrowded appearance. Less is more in a small space. Don't clutter with too many small pieces of furniture. These are just as bad as too big pieces. Use art objects that activate elements, such as metal for west directions and wood for east and southeast. Adjust water features to scale. Too much of any element will create imbalance of chi energy. If your apartment has restrictions on water features, use color (black and/or blue) to represent water, pictures of meandering stream or smooth bodies of water (avoid oceans, rivers, and rushing waters). Use photo frames and place on a console or end table in the north sector. Avoid putting anything underneath the bed. This creates stagnant energy that can cause illnesses, loss of income and other negative effects. Store clothes in closets, chests, armoires and dressers. Avoid all types of clutter. Empty trash regularly, don't allow dishes to accumulate in the sink and keep all appliances in working order. Changing light fixtures isn't possible in most apartments, but you can add floor and table lamps to invite chi energy into your home. Most apartments have limited space, so you can maximize it with multi-functional furniture. Avoid the temptation to put a desk in your bedroom as a way to conserve space. Using a restive retreat area as a work space will generate too much yang energy and make for fitful sleep. Instead of placing a desk in the bedroom, select a small drop leaf table that can double as a dining table and a desk. When not in use, the leaves can be lowered and set against the wall so it's out of the way and allows chi energy to flow easily. Set a table lamp on the table to inviting chi energy into that space. If you can hang things on your wall, another alternative is a fold-up desk. 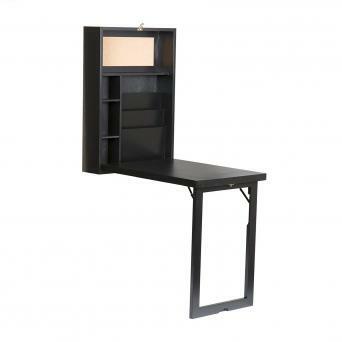 This unit resembles a narrow thin cabinet that simply unfolds into the wall cabinet. It's compact and ideal for a feng shui apartment. While it may be tempting to add floating shelves, avoid these and opt for a closed bookcase either with wood or glass doors. Open bookcases or floating shelves create poison arrows. Wall units or tall slender cabinets are great to add storage in a bathroom. Living in an apartment can bring unique feng shui challenges, but many there are many common remedies that can also be used for apartment feng shui. Focus on keeping your apartment clutter free, clean and inviting to auspicious chi energy and you will reap its many benefits.